Ah, summer. We love you. But with the warmer weather comes a whole new set of worries. With all of the coverage in the news about the Zika virus, summer can be a little scary, especially if you’re pregnant, or know someone who is. So, here are some the facts you need to know about this virus. Pregnant women and their unborn babies are particularly vulnerable to the Zika virus. Symptoms usually subside in less than a week, are mild, and rarely require hospitalization. However, because the disease affects people differently, only 1 in 5 of those infected will have symptoms. Mosquitoes can carry Zika from person to person. If a pregnant woman is infected, the Zika virus can be transmitted to her baby while she is pregnant. Mosquitoes that spread Zika virus bite both indoors and outdoors, mostly during the daytime. There are some confirmed cases of Zika virus in the United States. 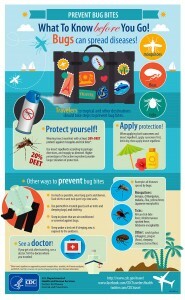 How Can You Prevent Zika? Wear long-sleeved shirts and long pants, or clothing made of fabrics treated with permethrin. When possible, choose clothing made with thicker fabric as mosquitos can bite through thin cloth. Stay and sleep in screened or air-conditioned rooms, or use a mosquito bed net (a permethrin-treated bed net is best). For those pregnant women who are afraid of using chemicals, in the form of insect repellents, to ward off summer pests, there are naturally occurring substances such as lemon oil, eucalyptus oil and citronella.